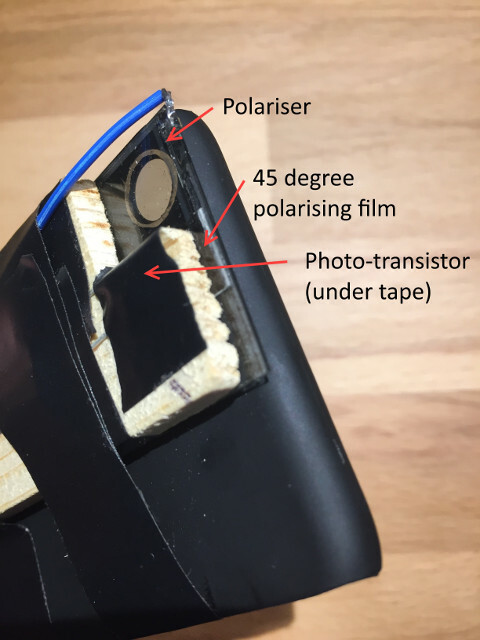 One of last year’s Hackaday Prize finalists was the DOLPi, [Dave Prutchi]’s polarimetric camera which used an LCD sheet from a welder’s mask placed in front of a Raspberry Pi camera. Multiple images were taken by the DOLPi at different polarizations and used to compute images designed to show the polarization of the light in each pixel and convey it to the viewer through color. 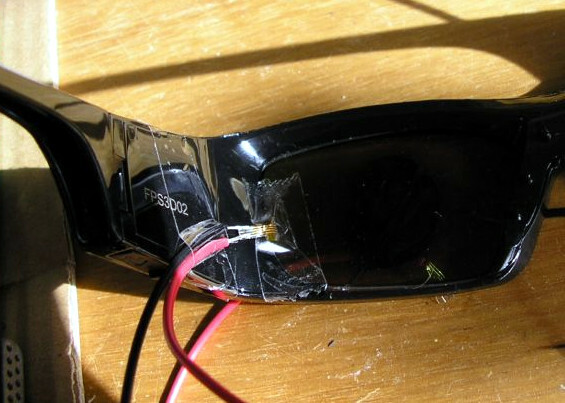 The polarizer and phototransistor taped to the iPhone. [Dave] wrote to tip us off about [Paul Wallace]’s take on the same idea, a DOLPi-inspired polarimetric camera using an iPhone with an ingenious solution to the problem of calibrating the device to the correct polarization angle for each image that does not require any electrical connection between phone and camera hardware. 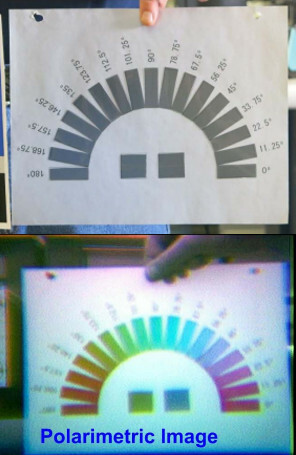 [Paul]’s camera is calibrated using the iPhone’s flash. The light coming from the flash through the LCD is measured by a phototransistor and Arduino Mini which sets the LCD to the correct polarization. The whole setup is taped to the back of the iPhone, though we suspect a 3D-printed holder could be made without too many problems. He provides full details as well as code for the iPhone app that controls the camera and computes the images on his blog post. We covered the DOLPi in detail last year as part of our 2015 Hackaday Prize finalist coverage. You can also find its page on Hackaday.io, and [Dave]’s own write-up on his blog. The build uses a standard Raspberry Pi 2 and a 5 megapixel camera which sits behind a software-controlled electro-optic polarization modulator that was scavenged from an auto-darkening welding mask. The mask is essentially a specialized LCD screen, which is easily electronically controlled. [David] whipped up some scripts on the Pi that control the screen, which is how the camera is able to view various polarizations of light. Since the polarization modulator is software-controlled, light from essentially any angle can be analyzed in any way via the computer. There is a huge amount of information about this project on the project site, as well as on the project’s official blog. There have been other projects that use polarized light for specific applications, but this is the first we’ve seen of a software-controlled polarizing camera intended for general use that could be made by pretty much anyone.